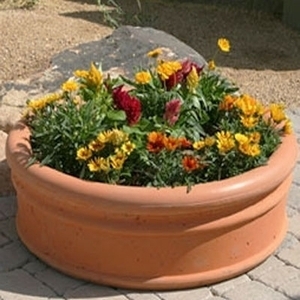 Our Italian Low pot is available in these two very large sizes. Each one is round with a large rolled rim surrounding the top and bottom. There is a center ring that also adds detail & design. Deep and wide enough to hold a huge display of flowers, cactus or succulents these pots work well where you need to fill space with color. Make sure you get out a tape measure when trying to choose a size.